Youth players battling it out in a local lacross match. Photo by T I G via Wikimedia Commons (CC BY 2.0). "La crosse" is a French term, but the sport was originally created by American Indians. 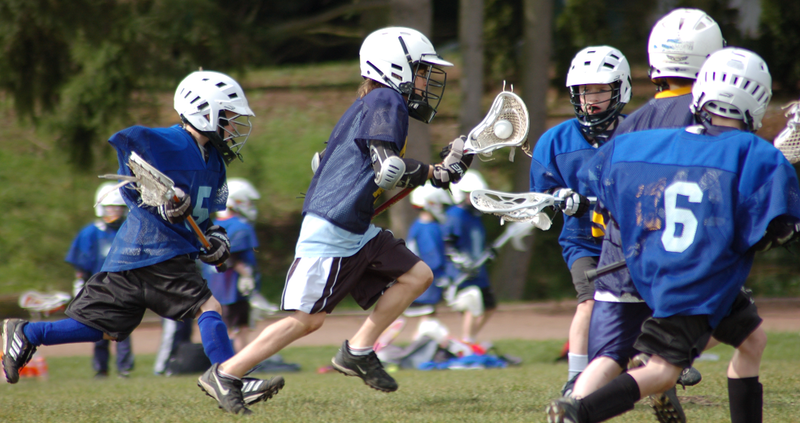 Lacrosse is a popular sport in North America and Canada especially during the summer months. In recent years, the sport has gained recognition on Long Island, with lacrosse being integrated into high school and college sports programs. It is a competitive team sport consisting of ten players of men, or twelve players of women on each team. Participants play on a field and use a long-handled stick or racket, called the crosse, with a netted pouch. Players use the rackets to catch and throw the ball with the objective of landing the ball in the goal of the opposing team. The sport has four major positions: midfield, attack, defense and goalie. Attackers try to get the ball in the opposing net while goalies and defensemen try to prevent the opposing team from doing the same. Midfielders can cover both sides of the field, though some may specialize more in one area of play than another. Lacrosse had long been a popular sport on Long Island, and with so many student athletes playing it can be difficult to get a leg up on the competition. Fortunately, Pro Game Athletics regularly holds clinics at their training facility in Bay shore to help players step their game up. Run by high caliber coaches, these clinics go beyond simple strength and conditioning, helping players to improve fundamental lacrosse skills. Pro Game offers its facility to teams looking to rent indoor space year-round. If you are looking to rent a half field or the entire facility there offer numerous packages for all sports to take advantage of. The New York Lizards are a Major League Lacrosse team. The professional lacrosse team is based on Long Island, New York. The teams' home games are generally played at James M. Shuart Stadium in Uniondale. The New York Lizards have won several MLL Championships and American Division Championships since the team was founded in 2001. Prior to December 14, 2012, the team was known as the Long Island Lizards. LAXADEMICS is a newly established educational advisement service born out of a need to refocus on the educational components that subscribe to the “right college fit” philosophy. A student-athlete's recruiting journey from the early onset requires a comprehensive understanding and approach. A sound educational approach along with realistic information will empower families control their own destiny. Most compelling is that the complex and ever changing lacrosse landscape calls for a need to educate prospective college student-athletes. Knowledge is power! That is the goal for our families & student-athletes we serve. This service subscribes to the mission philosophy of US Lacrosse. We pledge 100% family satisfaction. Visit Website.